The Classic mattress (queen) has 800 pocketed coil springs (each spring is individually wrapped in fabric) and provides edge support by using thicker wire in the springs near the edge of the mattress (2 rows of 13.25-gauge coils – the other main springs are 15.5 gauge). In general the more coils in the mattress the more support you will get – the other Beautyrest mattresses (queen) have 980 or 1960 pocketed coils. The Classic also uses a combination of “premium foams” (Simmons don’t elaborate on the premium foam details) and visco memory foam, and there is also a fire-retardant fiber. There are firm, plush or pillowtop options with the Simmons Beautyrest Classic mattress. Firm, as the name states, has a more pressure resistant sleep surface, plush provides a “cushier” sleep surface via the use of the premium and memory foams, and pillowtop uses layers of foam in the top upholstery creating an especially soft sleeping surface. The Beautyrest Classic mattress also has a single sleeping surface and does not require flipping. Ratings are hard to come by on this mattress series but Buzzillions has 4 customer reviews that provide an average 4 stars out of 5 for the Beautyrest Classic Baran. 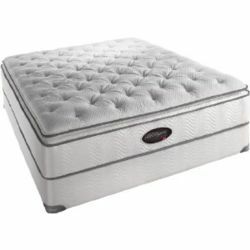 Macy’s has 4 reviews of the Simmons Beautyrest Classic Hawthorne Plush and the consumers rate this mattress an average 5 stars out of 5.